It struck such a nerve. I have spent so much time worrying about my house not being clean enough, but I realized that it’s messy because we are busy living in it, and being a family. There is dog hair and cat hair because we rescued our pets and brought them in to be a part of our family. There are toys about because our kids were playing (and my daughter is a slob). There are craft supplies out from my kids using their imaginations. 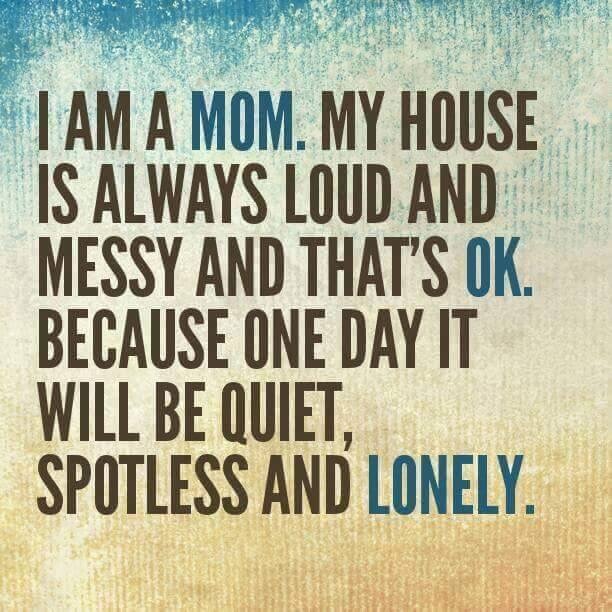 One day, the house will be emptier, the kids will be grown, and I know I will miss these days of mess. I know that one day, I won’t have to rush to pick up kids. I won’t have to keep track of 4 schedules. Things will be simpler. Yet oh, I know how much I will pine for the days of chaos. I have heard mom’s before me echo this sentiment. I dread the day they no longer need to race around picking them up, getting them where they need to be. I know that while my life is often chaotic, with me often muttering “chaos, my life is chaos”, I know that I am doing something right. While decluttering some paperwork, I came across a paper my son wrote for school, where he calls me a fun mom, and that he loves me. He knows I am not perfect. Both kids know I make mistakes, I may not always get it right, but I will most of the time. They know that when the chips are down, I have their back. They know I will be there when they need me. They know I will do whatever it takes to protect them, and keep them safe. Sometimes, I know I am strict. Other times, I let things slide. My kids know the rules we have in place, and they know our expectations. Sometimes, they break the rules, and there are consequences. Sometimes, I make the wrong call on something, and I have to apologize to the kids. Parenting isn’t something you get a handbook on with all of the right things to do. Sure, there are books (full of opinions), social media (full of opinions) and the Internet (full of opinions). There are mommy groups (full of opinions) and even strangers feel compelled to walk by and give you their opinions on how to parent. That’s a lot of friggin opinions! Opinions are like assholes, everybody has one, right? 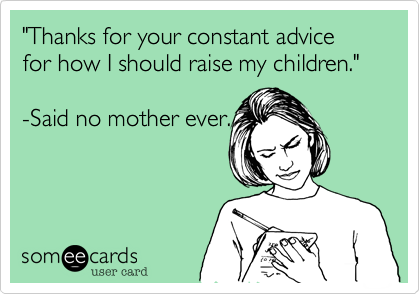 I used to get overwhelmed by opinions, especially when it came to my parenting. I used to worry that people were thinking I was doing a bad job. People would drop an offhand comment, and I would obsess about it. Was I doing parenting wrong?? Then I began to see that people just love putting their opinions out there when it comes to parenting. There was no reason I had to listen to them. The fact is, I have healthy, happy kids. They are kind. They are loving. Sure, they have moments where they don’t behave. But on the whole? They are great kids. People can have all the opinions they want, but I’m gaining confidence I am doing the right things. I’ve learned to do what my gut tells me. It rarely ever steers me wrong. So here I sit. The house is pretty messy, I have no idea how I will get everything done I need to do this week, and I am sure I have probably done a mothering fail already this week. Such is life. On the flip side though, I did the dishes, set a few reminders on my phone for things I need to do, and had both kids bent over laughing tonight. I’ll take that for the win.